As far as headline numbers go, the Piñera administration has been a resounding success. So why do most Chileans deem it a failure? As Chile’s first right-wing government since the end of the Pinochet era comes to a close, the opposition Concertación seems almost certain to return to power when voters head to the polls in November. That might be the least of the changes afoot in Chile. Last month Chilean president Sebastián Piñera saw his approval rating rise to its highest level in over two years – 40 percent. 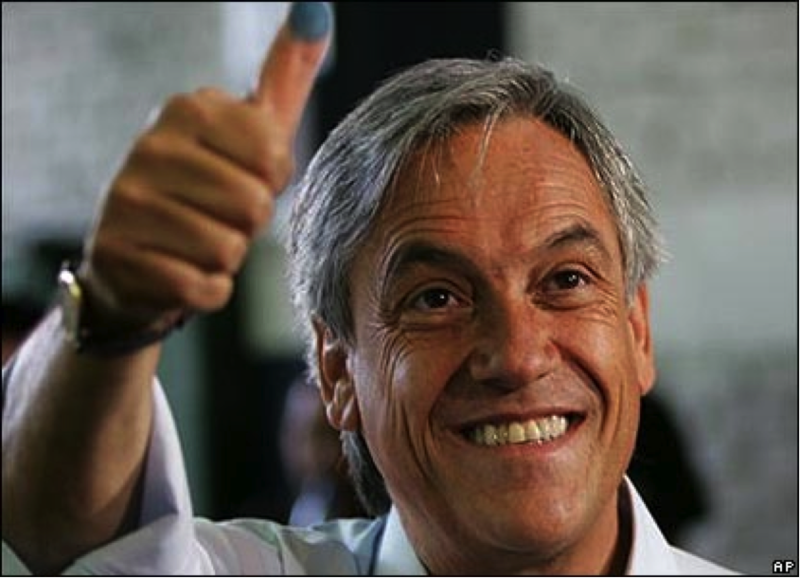 Perhaps Chileans were simply happy that Piñera will soon be exiting the stage: his presidency expires next year and he is not eligible for reelection. The billionaire businessman has been roundly unpopular for most of his four-year term, setting several records for public disapproval and inspiring a cottage industry of Piñera mockery, all while contending with fierce protests from diverse sectors of society. This reception would seem a bit harsh given Chile’s sterling economic record over the past four years. With most of the world ravaged by recession, Chile has grown at 5.7 percent a year since Piñera took over, attracted a horde of foreign investment, and cut unemployment to around 6 percent – close to full employment according to economists. The OECD recently revised its 2013 growth project for Chile upward, making the country something of an oddity in the current global economic environment. While business is booming, social unrest has rocked Chile for much of past two years. Massive, sometimes violent protests over major energy projects, the treatment of Chile’s indigenous Mapuche community, and most dramatically, the education system have put the government increasingly at odds with a large portion of the Chilean population. The Piñera administration, moreover, has proven itself totally incompetent in addressing these social fissures. The president’s response has been erratic and unmoored from any guiding principle, one moment accommodating protestor’s demands and the next taking a hard line. An early acquiescence to relatively small protests over the Barrancones power plant, in which the President intervened personally to stop the project after environmental authorities gave it the green light, has been criticized as a grave blunder that only encouraged more protests surrounding energy projects and other environmentally sensitive investments. But the student protests have undoubtedly done the greatest damage to the President, and they are also the most emblematic of Chileans’ widespread disaffection with their government. The protests erupted with little warning in June 2011 and quickly gained momentum with demonstrations growing larger and often violent as small groups of students engaged with riot police. 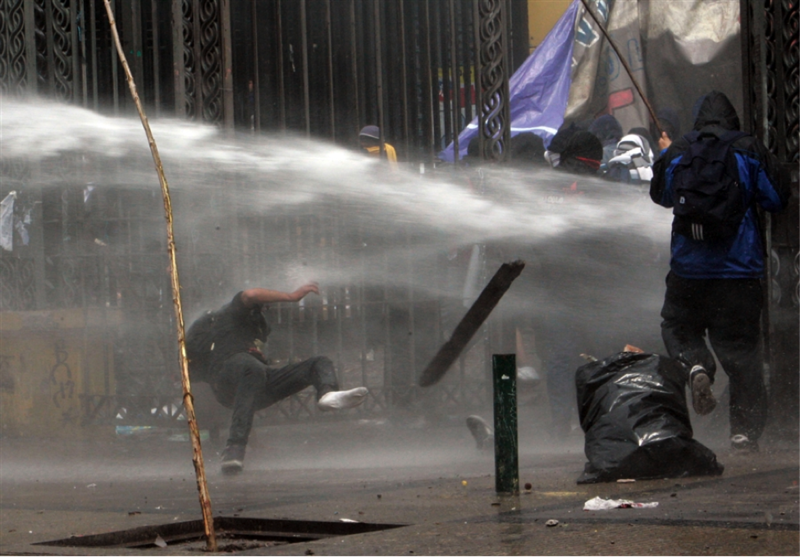 Perhaps seeking to compensate for Barracones, the President has taken a hard line with the students, and security forces have made liberal use of water cannons, tear gas, and paint guns to keep protestors in line. These tactics have helped bring public opinion firmly behind the students. A recent poll showed a full 86 percent supporting the students’ demands, while a smaller majority (57 percent) supported the marches. Disapproval of the government’s handling of the conflict (82 percent) is equally strong. The students want free, high quality education for all and an end to profitmaking by universities, which is officially prohibited but still occurs thanks to creative contracting arrangements, salary allocations, and rent payments among other loopholes, as investigations last year laid bare. The government’s position has been that making higher education free for all would be regressive and that the focus should be on improving quality instead. The debate reflects serious flaws in Chile’s higher education system, which requires tuition fees for both public and private universities that have been rising every year, even as the quality of universities is uneven. Government grants or loans usually cover 70-80 percent of student fees, but this system saddles graduates with debt that is out of proportion with their earnings prospects, especially for graduates of less prestigious institutions. Perversely, while the interest rates on student loans are capped at 2 percent for a handful of traditional universities, rates paid by students at newer, less-established, and often poor-quality schools can be almost three times as high. Unequal access to quality education exacerbates Chile’s income inequality, already among the worst in Latin America and a major reason why strong growth has not translated into broad social welfare. But the student movement also reflects a deeper sense that Chile’s political system and the elites who control it have lost the capacity to respond to citizens’ demands. Perhaps the only institution less popular than the presidency is the opposition: a May poll showed approval of the Concertación, Chile’s center-left coalition, to be a puny 23 percent. Indeed, the same university students who have taken to the streets in recent years also staged massive demonstrations as high schoolers during the government of Michelle Bachelet (2006-2010). The students, like other groups, were gravely disappointed by the lack of reforms under Bachelet, a sense of frustration that has only grown during the past four years. A spate of ugly incidents have marred early campaigning, including a student spitting in the face of Michelle Bachelet, UDI candidate Pablo Longueira being pelted with an egg and called “fascist” by a group of fisherman, and an arson attack on the headquarters of Christian Democrat candidate Claudio Orrego. These incidents, uncharacteristic of Chile’s political culture since the return to democracy, show a visceral rejection of the status quo among broad swaths of Chilean society. Politicians seem to have taken notice. Candidates vying for the two coalitions’ nomination have put forth proposals to reform education as well as Chile’s tax system, which does little to reduce high levels of inequality, its privatized pensions, and its energy policies. Bachelet, the former president and strong front-runner, recently unveiled an education proposal adopting the students’ main demands and wants to include (some would say coopt) their leaders in her campaign team. 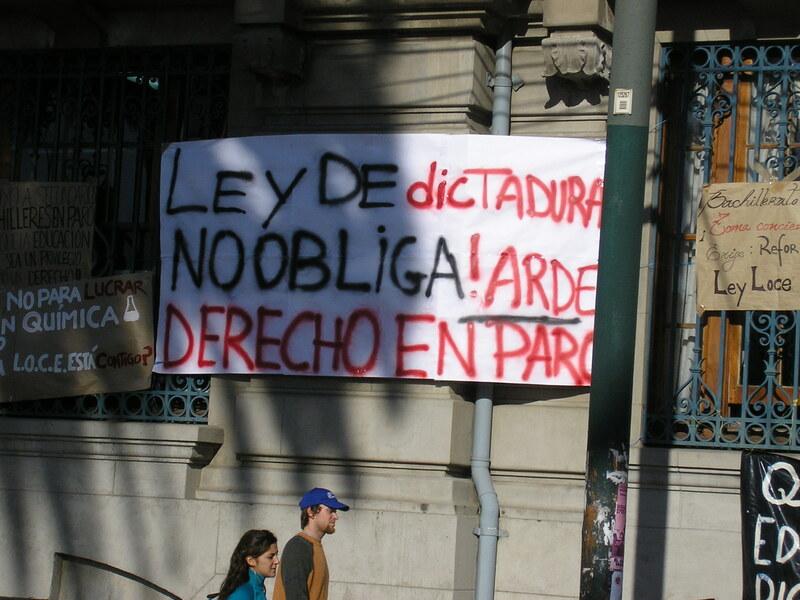 Most importantly, constitutional reform is now squarely on the agenda, a major development in a country whose current constitution, written in 1980 under Pinochet, has been long criticized for so-called authoritarian enclaves that help retain power for right-wing parties, centralize authority in Santiago, and limit protection of individual rights. Candidates for the nomination of the New Majority coalition (consisting of the traditional left-wing Concertación plus the Communist Party) largely support the need for reform but differ over how it should be accomplished. The most controversial idea is to elect a Constitutional Assembly to write a new document. Of course, there is a possibility that substantive changes will be stymied, and things will return to business as usual under the Concertación. The right-wing parties generally reject the need for fundamental changes to Chile’s constitution and are particularly hostile to the idea of convening a Constitutional Assembly, which they say would deal a blow to Chile’s business-friendly reputation. Still, given the current state of agitation in Chile, it appears very likely that major reforms can no longer be avoided. The end of the Piñera years seems to be coinciding with the exhaustion of a political system that provided needed stability following Chile’s democratic transition but has become stagnant and dominated by a small number of elites. This system, with its tendency to prop up conservative forces on both sides of the political divide, is ripe for a shake-up. If the final outcome of the Piñera administration is in fact the undoing of Chile’s authoritarian legacy, it would truly be a most successful failure. Mexico – China Relations: Flipping the Script? 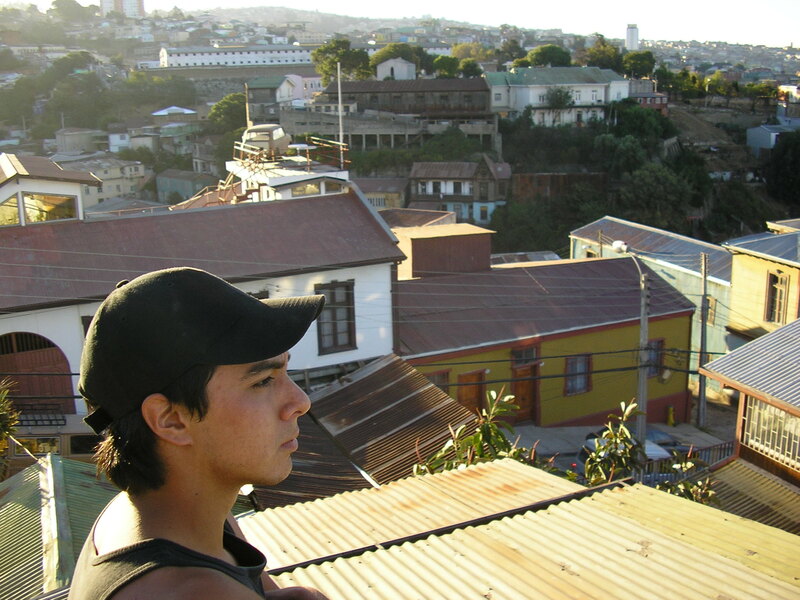 This entry was posted in Andean Region, Southern Cone and tagged chile future, Chile pinera, chilean election, chilean youth, chilean youth protest, pinera protest, pinera unpopular. Bookmark the permalink.